The top-performing brands are reimagining the partnership structure with their key retail partners. And this new dynamic puts a heavier burden on the manufacturer to produce and distribute better content for merchandising - and act like a partner rather than strictly a supplier. You need the ability to publish your content to every commerce destination that exists today or appears tomorrow in the best available and most up-to-date format. The ecosystem for your content might include business partners like Clavis, ratings & reviews engines like BazaarVoice, and most importantly, your retail partners. Wouldn’t it be great if every retailer had an automated way to accept that content? We agree. That’s why we’re working with companies like Walmart, Home Depot, Amazon and others to push for more automation in the way in which they accept content from their brands. Learn about retail global giant Walmart's recent ecommerce urgency. 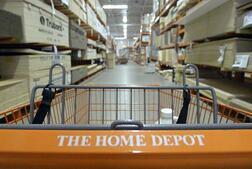 Learn how Home Depot grew its online business by more than 19% last year. Home Depot has made great strides in online business by committing to an automated way to accept content from their brands. Learn what challenges and opportunities brand suppliers face on Home Dept and how you can get content directly to Home Depot today. Retailers, like Walmart and Home Depot, are constantly trying to optimize their site experience and exploring better ways to personalize consumer experiences, the changing requirements and demands for new content will only continue and rapidly increase over time as consumer preferences change and adapt. This knowledge gap between brands and retailers is why we believe that the only way to affect real change is through building a union of brands to push back on retailers to ask for more automated ways to accept content. For more information on how brands and retailers are tackling distributed commerce to meet shopper demands, get the full results of our survey. Download our ebook: Win the Sale: How Data on How Brands and Retailers are Tackling Distributed Commerce. We hope this data helps facilitate the next conversation you have with your retail partners. If your organization is struggling with ecommerce growth and/or digital strategy, you can learn what others in your industry are thinking about these issues.